A day after the inauguration of US President Donald Trump, millions around the world joined the 2017 Women’s March. A key aim was to highlight women’s rights, which many believed to be under threat. Another defining moment came when sexual harassment claims were made against film producer Harvey Weinstein by more than 80 women – allegations he denies. Online movements have also gained momentum. Actress Alyssa Milano suggested that anyone who had been “sexually harassed or assaulted” should reply to her Tweet with “#MeToo”, resurrrecting a movement started by activist Tarana Burke in 2006. 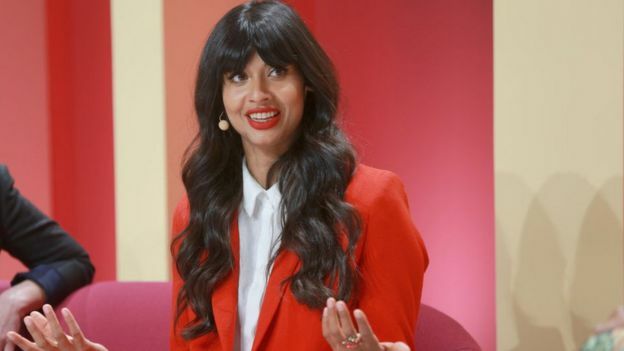 Many other celebrities have publicly embraced feminism, including actresses Emma Watson, who launched an equality campaign with the United Nationsand “body positivity warrior” Jameela Jamil. 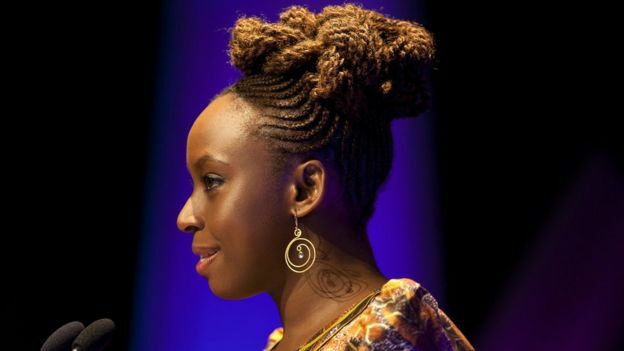 Movements like #everydaysexism and discussion points such as author Chimamanda Ngozi Adichie’s Ted talk, We should all be feminists, have also struck a chord with millions. 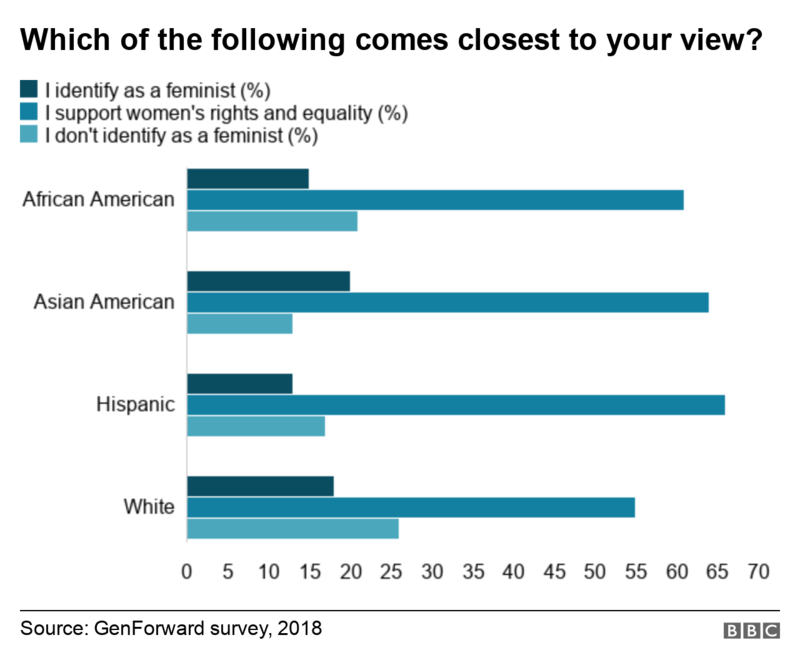 So it is perhaps unexpected that the identity “feminist” has not gained more popularity among young women in the Western world. 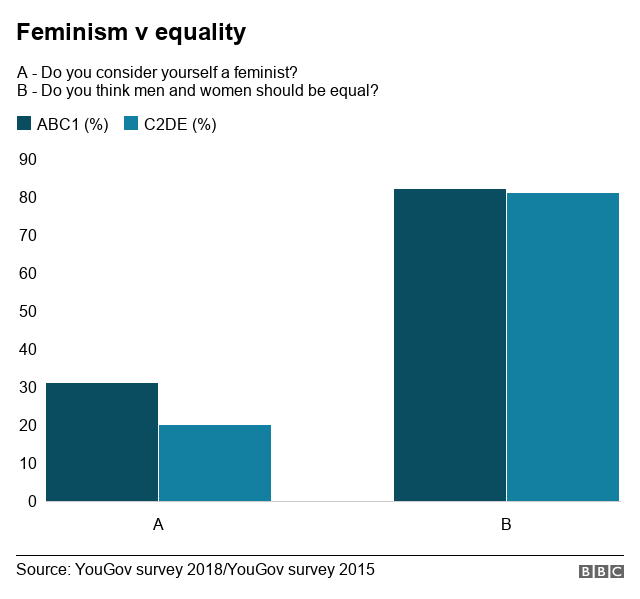 A 2018 YouGov poll found that 34% of women in the UK said “yes” when asked whether they were a feminist, up from 27% in 2013. 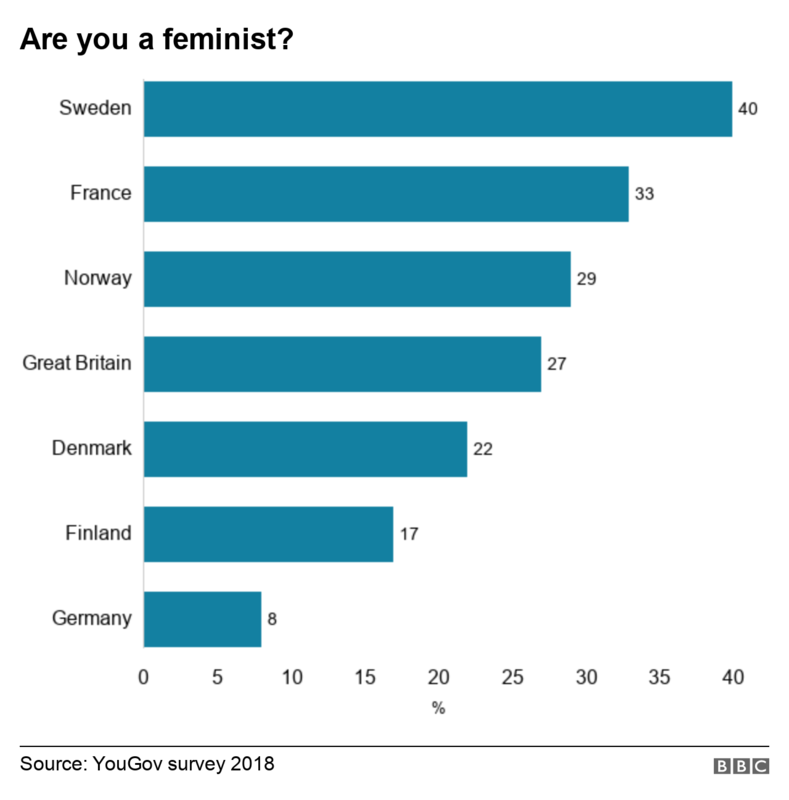 It’s a similar picture in Europe, with fewer than half of men and women polled in five countries agreeing they were a feminist. This ranged from 8% of respondents in Germany, to 40% in Sweden. And in a 2017 UK poll, 8% said they agreed with traditional gender roles – that a man should earn money and a woman should stay at home – down from 43% in 1984. If many believe gender equality is important, and still lacking, then why do relatively few people – including young women – identify as feminist? Almost one in three people from the top social grade ABC1 – those in managerial, administrative and professional occupations – called themselves a feminist in a 2018 poll. This compared with one in five from grades C2DE, which include manual workers, state pensioners, casual workers, and the unemployed. This may suggest lower income groups support the principle behind feminism, but aren’t keen on the word itself. 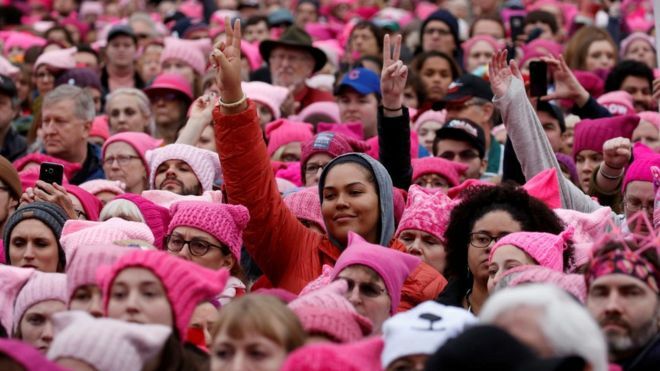 Three-quarters of all the women polled said the feminist movement has done either “a lot” or “some” to improve the lives of white women. However, just 60% said it had achieved much for women of other ethnicities – a sentiment shared by 46% of African American women. In her introduction to the recently published anthology Feminists Don’t Wear Pink and Other Lies, curator Scarlett Curtis refers to the stereotype of feminists as not wearing make-up, or shaving their legs or liking boys. Having interviewed a diverse group of young German and British women for my research, I found associations of the term “feminism” with man-hating, lesbianism or lack of femininity was a key factor in rejections of the label “feminist”. Nevertheless, whichever label women choose to adopt, the indication that the vast majority of people now support equality – and acknowledge it has not yet been achieved – is heartening.